Spring’s JdbcTemplate helps in resource management and exception handling, we just need to encapsulate the database statements in a callback object and pass it to JdbcTemplate for execution. In this article, I will show you an example of how we can execute database operations using JdbcTemplate. 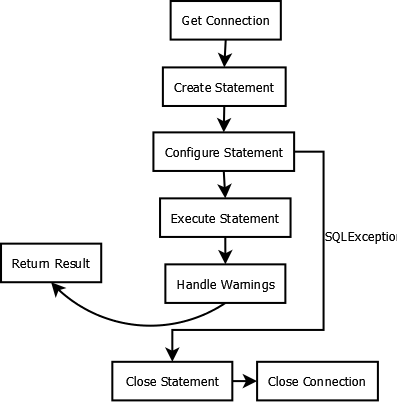 The diagram below defines the JDBC steps in executing an operation. JdbcTemplate needs a DataSource object for database access. The actual DataSource object being referred to by JdbcTemplate can be any implementation of javax.sql.DataSource. In our example, we will base our DataSource on org.springframework.jdbc.datasource.DriverManagerDataSource. Once we have configured DataSource bean, we will have to inject it into JdbcTemplate bean. We can then wire the JdbcTemplate bean into our example class and then use it to access the database. In the below applicationContext.xml, you can see all the configured beans. SpringJdbcTemplateExample will be our example class. It will act as our application class as well as bean. In its main method, we get its bean from our context and execute the database statements using JdbcTemplate object. In case of any SQLException , spring catches it and re-throws it as DataAccessException. There are many exceptions that extend from DataAccessException like BadSqlGrammarException, CannotAcquireLockException etc., each exception addresses a specific failure and represents an error category. Internally, spring maps the SQL error codes based on error category for each database. The exception hierarchy extending from DataAccessException aims to let user code find and handle the kind of error encountered without knowing the details of the particular data access API in use (e.g. JDBC). The caller encountering the exception is in a better situation to handle it as the exception is more specific rather than the generic SQLException and also has reference to the actual SQLException that caused the error. If you notice my example, in the end, I execute a bad query to demonstrate how spring manages exceptions. It throws BadSqlGrammarException as the column name specified in the query is wrong. Instead of we explicitly maintaining the JdbcTemplate member, its setter and getter methods, we just need to extend JdbcDaoSupport class to inherit its getJdbcTemplate.